Showing dogs is a sport that is enjoyed by many. Dedicated dog owners may spend a lifetime enjoying this hobby while others make it a true business. 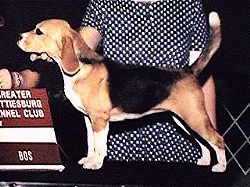 Breeding the right dog, training that dog, and ultimately having that dog win is moment not to be taken lightly. There are many pitfalls and heartbreaks along the path. Only the heartiest and determine souls stay in this game. Let's start with the most important ingredient-a show quality dog. It is very difficult to predict at 8-12 weeks of age what an adult dog will look like. Breeding/genetics determine how the puppy will look at adulthood. An educated risk is how I describe the purchase of a show potential puppy. You then must train and condition this dog and pray that some hidden fault will not be found (i.e. hip dysplaisa or epilepsy) as your puppy grows up. Selecting your puppy can be an endeavor; you must study the breed standard, ask questions, look at what the breeder has accomplished with his/her breeding program and ask even more questions. Once you have selected your puppy, then you must train the puppy and yourself to show. This training is more involved than just "running around the ring." Hours must be spent propely stacking and gaiting the puppy and critiquing your own moves and actions. Even the knowledge of how dog shows are organized can be a major obstacle and learning experience. Training, grooming, and preparing for the first show can be overwhelming. Many dog lovers do not understand the structure and expertise necessary to show your own dog and win. As a breeder, my greatest thrill is to show one of my own babies to their championship and group placements. Becoming a judge is a time consuming endeavor. I also enjoy judging my breed and educating prospective judges.